While hybrids and electric vehicles (EVs) have been paving the way for more environmentally-friendly forms of personal transportation, the love of motorsport isn’t dying out anytime soon. From rallying to autocross to F1 racing and Nascar, the fact of the matter is that people living in countries all over the world simply love the thrill of racing. Perhaps the appeal lies in the adrenaline rush from stomping on the gas pedal, or maybe it’s from the satisfaction of a near-perfectly executed turn on the track. Maybe humanity’s love of racing and motorsport is just ineffable, and if that’s the case, then that’s perfectly okay. All we know for certain is that driving fast cars is just plain fun and enjoyable. 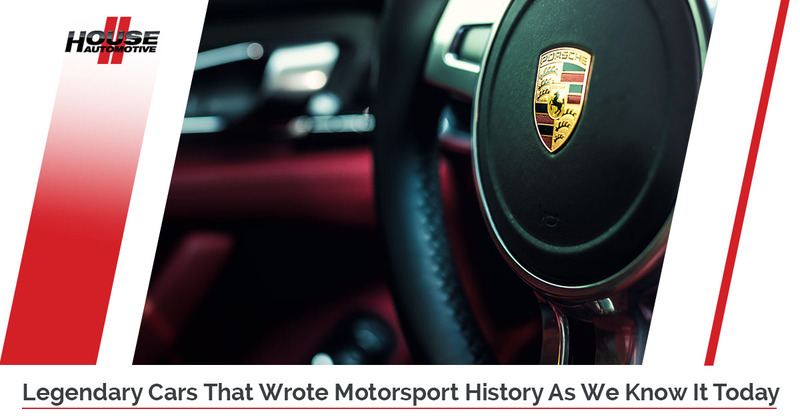 As it’s probably no surprise to you, dear reader and probable Porsche enthusiast, but the Porsche brand has enjoyed a longtime reputation for motorsport excellence. Having built countless models of track-only performance vehicles over the decades, the Pasadena Porsche repair professionals here at HOUSE Automotive are more than proud to carry on Porsche’s reputation and legacy as a high-performance automotive manufacturer. That’s why we’re going to cover some of racing’s most iconic and influential cars throughout motorsport history, including Porsches and other types of vehicles. As always, feel free to learn more about our Porsche repair shop in Pasadena, or get in touch with HOUSE Automotive with any questions about our Porsche auto repair services. Naturally, HOUSE Automotive had to begin with one of our own. A truly iconic racing Porsche, the 917 faced its fair share of challenges until 1970, when most of the kinks had been worked out. The result was a track-based supercar that was capable of hitting mind-blowingly high speeds up to 240 mph – virtually unheard of at the time, and still incredibly impressive by today’s automotive standards. After winning the 24 Hours of LeMans in 1970, Porsche figured, “Why not do it again?”, and so, true to their word, they won the 24 Hours of LeMans again in 1971. For an immensely demanding and mentally draining 24-hour race, that’s pretty impressive. Fun fact: The Porsche 917 was also used in the 1971 Steve McQueen movie LeMans. Lancia isn’t a commonly-recognized brand name over in the states, unless you’ve watched your fair share of Top Gear (the U.K. version, of course). An established and well-recognized name in the rallysport scene, Lancia was one of the very first automakers to build a true rally car from the get-go. Before the 1970s, rally cars weren’t exactly specifically designed for rallying. Rather, existing cars were modified to become rally cars, and the legendary Lancia Stratos changed that. With the intention of being a true rally car from the factory, the Stratos was a wild success in rallysport, winning some 18 WRC races and taking the World Rally Championship three years…in a row. Ford’s timeless design on the GT40 really solidified its place in motorsport as well as a production vehicle. Originally pitted against Ferrari, a major motorsport competitor of Ford at the time, people laughed at the idea that Ford could produce something that would actually beat out Ferrari. Sure enough, and despite the fact that Ferrari had one the LeMans the previous six years before the GT40 participated, this beautiful Ford managed to win the LeMans for the following four years. It wasn’t until Audi had developed their signature Quattro all-wheel drive system that they were dominating the rally sector. With superior traction and handling over most, if not all of Audi’s competitors, the Audi Sport Quattro just couldn’t stop winning rally races. One of the most famous victories for Audi’s Sport Quattro was the Pike’s Peak hill climb in 1987, a high-altitude race near Colorado Springs that pushes vehicles to their absolute limit. In the heyday of the mid-1980s, the Porsche 962 was dominating the professional racing circuit. After winning the 1985 and 1986 World Sportscar Championship, the 962 also went on to win the 24 Hours of LeMans in 1986 and 1987. The same car, though heavily modified, even went on to win the 24 Hours of LeMans in 1994! To be safe, we wouldn’t recommend racing your Porsche on our beautiful Los Angeles roads. However, when it comes to Porsche Cayman repair, Porsche Panamera repair, or any other independent Porsche repair services in Pasadena, HOUSE Automotive is here for you. Get in touch with us today!